Taking a break from the hectic streets of fashionable Harajuku to walk the gardens of this peaceful shrine in the heart of the neighborhood. This is the largest Shintō shrine in Tokyo, built for Emperor Meiji and Empress Shōken. The front gates are marked with a large torii which is a traditional gate made from a Japanese cypress tree. 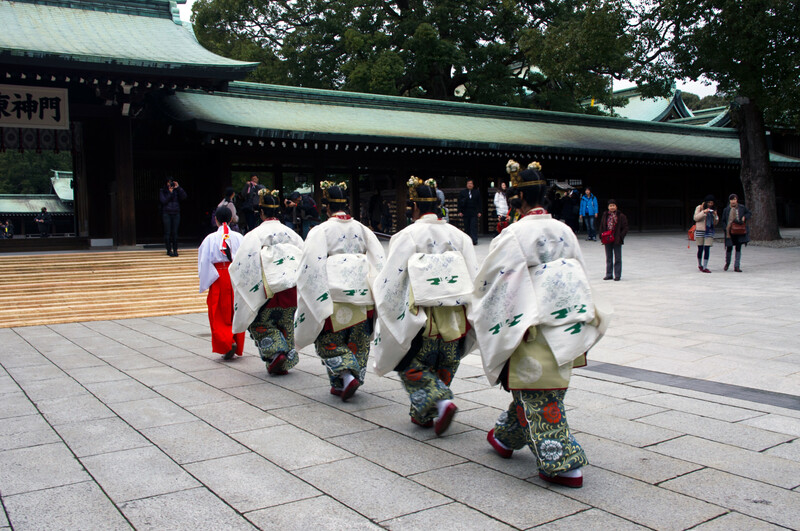 There are many shrines in Tokyo, and Meiji Shrine is one of the most popular, and we think one of the most beautiful. Built in the Nagarenzukuri style, with only the best timber (Japanese cypress) this impressive shrine is subtle in its colors and design, making it a serene and quiet, place for locals to come to pray. There are two areas of the shrine Naien which is the inner garden and Gaien which is the outer garden. Inner garden houses the shrine buildings which includes a museum containing artifacts that belonged to the Emperor and Empress. Outer garden has a Meiji Memorial Gallery as well as a National Stadium and a Meiji Memorial Hall, often used for traditional Shinto weddings. 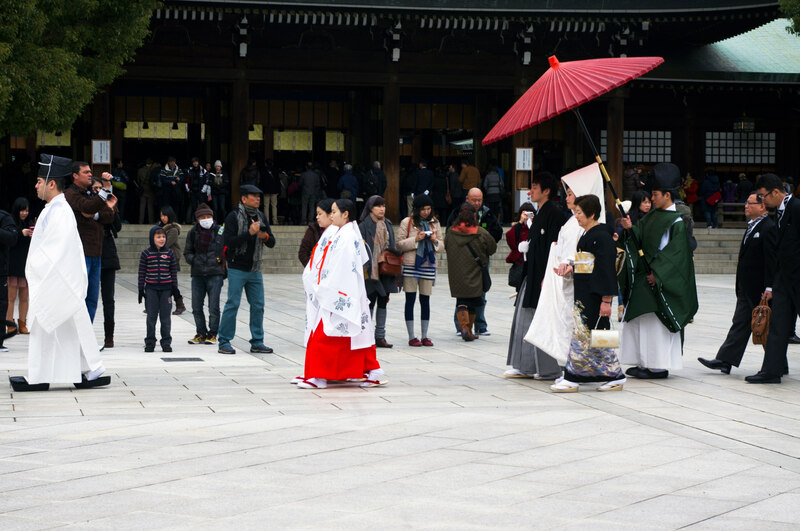 During the warmer months it’s not unheard of to catch a glimpse of a wedding party in wonderful traditional wedding kimonos. 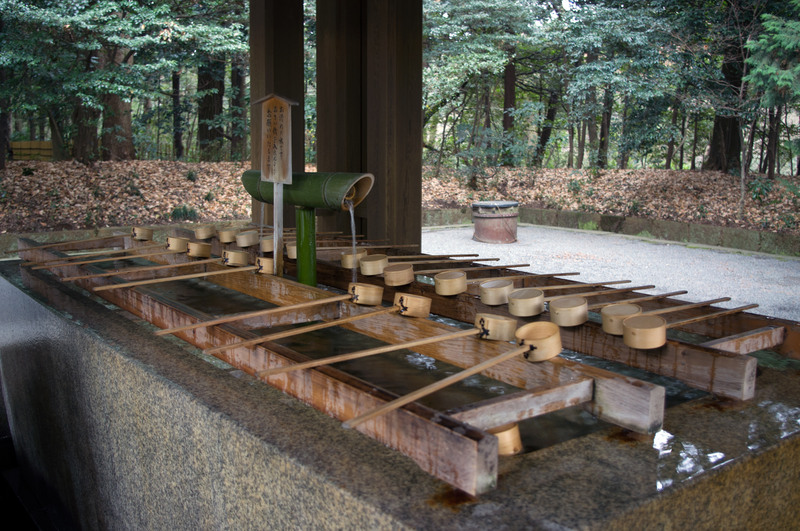 Upon entering you will notice a cleansing station called an okiome, here you will see people purifying their hands and mouths (as is customary) before entering the shrine and offering up prayer. Use the ladle like dipper to pour water into your cupped hands to purify, than pour a little water into your left hand to bring to your mouth to rinse, do not drink directly from the ladle. Do not swallow the water you can discreetly let it drop in the drain on the ground. You might notice locals doing a ceremonial head bow and clap, to do this you bow your head twice, than clap twice than bow your head once more. 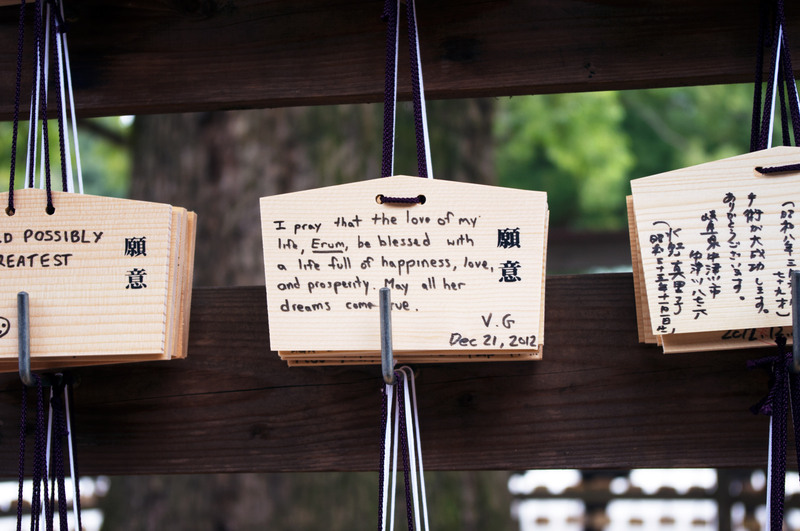 Once you enter the open air hall you can write a prayer on a tiny piece of wood called an Ema tablet, which you are then suppose to tie to the prayer wall. To take part in this don't forget to toss a few yen into the offerings box. The shrine is open from sunrise to sun set so hours during the summer run between 5 am to around 6 pm. Winter hours are shorter running between 6:30 am and 4:30 pm, except on December 31st when the shrine is open all night for the annual New Years Eve celebration. If you happen to be in Tokyo on New Years this is the busiest shrine packed with thousands of locals and visitors who gather to hear the bells ring at midnight.